The spectacular red cliffs of Waterberg’s table mountain rise like a fortress out of the Namibian savannah. Here, in a lost world, hundreds of species of animals; some rare and endangered, find shelter. It was not always like this. Waterberg has a dark history. In 1904, the proud Herero people were defeated in an epic battle against the German Empire and were eventually forced from the Waterberg. Decades later, another war raged. But this time Waterberg gave hope. In the early 1970’s when SWAPO’s war of independence against the South African occupying forces in the north of the country grew increasingly brutal, wildlife sanctuaries became battlefields. The lives of hundreds, even thousands of wild animals were at stake. Salvation came when a handful of conservationists took action. They trucked dozens of endangered animals from the perilous refuges to the safety of the Waterberg Plateau. Sable antelopes and elands, African buffaloes, giraffes, and black rhinos were rescued. 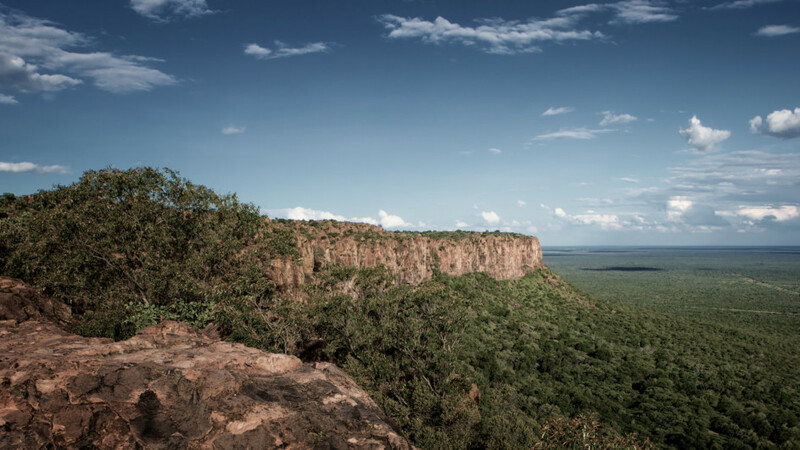 The Waterberg, surrounded by treacherous cliffs – impossible to climb without being observed and impossible for large animals to descend – provided the protection wildlife needed to survive. Now, poaching, cattle farming and population growth have replaced the chaos of war as the new threats to Namibia’s wild animals and their habitats. The Waterberg, however, has remained a haven for the endangered black rhino, a variety of antelope species, and one of only two buffalo herds in Namibia that has been spared the decade-long rampage of rinderpest and foot-and-mouth disease. The secret to Waterberg’s success lies in its isolation. It can only be reached by means of a secured gravel road. Visitor access is strictly limited and closely monitored. Now, the Waterberg and 400 square kilometres surrounding the plateau is a national park. In addition, around ten thousand hectares of cattle farms have been re-natured by their owners. The combined effect is an extensive refuge. It is Namibia’s only original grassland. Here, herds of elands, sable, roan antelopes, and blue wildebeests migrate across the plains just as they did two hundred years ago. While from their roosts on the red cliffs of the plateau, some of the world’s last Cape vultures spread their giant wings to take flight across this little Serengeti at Waterberg.